Yoga is an art form that can be traced back thousands of years ago to ancient India. Now in 2019, over 36 million people practice yoga, and the benefits range from flexibility to reduced stress. With new research on this ancient practice, we now know that the advantages also include improvements to your oral and overall health. Discover how consistent yoga practice plays a crucial role in keeping your smile in top form. Yoga is a spiritual practice, but also one that can be physically demanding. There are many styles of yoga that emphasize different aspects, but one thing that’s common in all of them is breath control. From the fast-paced movements of Vinyasa style to the classic meditation inherent in Kundalini Yoga, deep, controlled breathing is always a major factor. This emphasis on stimulating lesser-used muscles and breathing deeply is at the heart of yoga’s effectiveness. How Does Yoga Help Your Smile? By choosing to practice yoga regularly, you’re opening the door to dozens of proven health benefits. In some indirect ways, yoga also provides advantages for your smile. 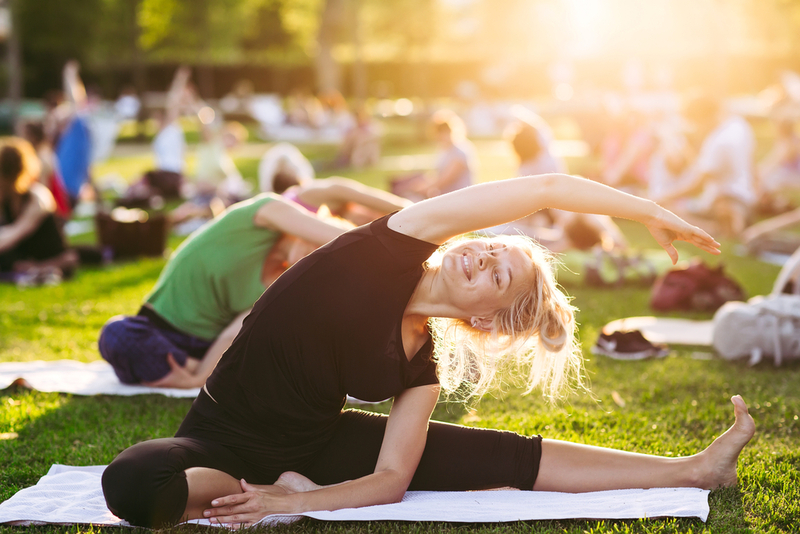 Find out why yoga can help you control stress, improve your posture, and reduce the need for medications, and how that benefits your smile. Arguably the most significant health benefit yoga bestows on its practitioners is that it greatly reduces stress. Excess stress is responsible for a massive number of health and dental problems, and worse yet, it’s unavoidable for most of us. This stress affects every aspect of our lives, from the mood we adopt when we’re home with our families to our ability to sleep through the night. The deep breathing, meditative nature of yoga is one of the most powerful stress relievers known to man. Gum disease, bruxism, and TMJ problems are just a few dental conditions that are brought about by excessive levels of stress. Each of these conditions can bring about pain and discomfort, and all of them will get worse over time if the stress isn’t managed. Dr. Darlene Hart of Pembroke Pines, Florida confirms the impact of stress on the oral health of her patients. The Mayo Clinic concurs that yoga is one of the best options for reducing the stress in your life and improving your sense of well-being. One of the most painful dental problems doesn’t involve your teeth at all. The temporomandibular joint (TMJ) is the hinge that connects your jaw to your head. Problems in this area can be painful, and they manifest in a variety of ways, including locking of the jaw joint and soreness in the surrounding area. Do you hunch over in your chair or walk with a crooked back? If your posture is sub-par, it can cause issues not only for your back and spine but also for the TMJ. For example, if you have a habit of biting heavily on one side, that could eventually affect the TMJ. Yoga encourages awareness of your alignment, as well as smooth, deliberate movements that strengthen your muscles and joints. If you want to put an end to your TMJ problems, roll out a yoga mat and reap the many benefits of the practice. We all know that medications can have side effects, but did you know that a remarkable number of those side effects increase the bacteria in your mouth that cause gum disease? Blood pressure medications in particular are notorious for this, as patients who frequently take these medications can end up with dental problems. We know now that yoga is phenomenal at lowering stress levels. However, the combination of lower stress and the physical workout aspect of yoga class work together to produce another advantage: Decreased blood pressure. That means avoiding the need for the medication that so many Americans have to take on a daily basis and sparing your teeth from the gum disease that’s associated with it. While it’s excellent at preventing a wide range of health issues, there are some that no amount of yoga can help. Explore these common dental problems and the specialists who can fix them. If your teeth are growing in different directions, the only thing you can do to fix the problem is visiting an orthodontist. Luckily, there are more options than just the metal braces of the past – Invisalign offers a discreet way to realign your smile, and specialists like Dr. Stephen Grussmark of Miami, Florida can ensure that it’s right for you before getting started. While yoga may help some symptoms of sleep apnea, the disorder can develop due to genetic predispositions as well. For example, a person might be born with an enlarged tongue, rendering them more likely to develop sleep apnea. If your snoring and sleepless nights continue longer than you’re comfortable with, visit a specialist like Dr. Mustafa Yazar of Kenton Dental Care for oral appliances which can help you get the sleep you deserve. There are countless hobbies, activities, and ways to spend our time in the world, but very few carry benefits like those found in consistent yoga training. If a healthy body and mind are advantages you want in your life, yoga is a sure path that leads to them. Consider making yoga a part of your life, and put an end to the many diseases and disorders that have become so prevalent in America.